Electrical Steering Column Lock Market size was worth over USD 17 billion in 2016 and its demand is projected to cross 180 million units in 2024. High demand for electric power steering (EPS) vehicles across the globe will primarily boost the adoption of electrical steering column lock market share from 2017 to 2024. Growing demand for EPS can be attributed to its benefits such as considerable fuel savings and quick response. Rising security concerns among customers will further escalate the revenue generation for electric steering column lock market over the forecast timeline. Strengthening electrical vehicles penetration coupled with stringent regulations regarding fuel economy will further contribute to the industry growth significantly. Frequent innovations in column lock mechanism have induced immense potential to the industry size over the past years. These advancements have led to enhanced and simplified vehicle design. For instance, NSK Ltd. introduced an innovative steering wheel column lock mechanism wedge gear system that enhances occupant safety during automotive collisions. It is designed with a wedge in the receiving gear surface and provides over 25% improvement in steering wheel position lock force over traditional design. Since there is no contact between the wedge and receiving gear, steering wheel adjustment is much smoother. Moreover, this innovative vehicle uses 70% less components than the conventional design. 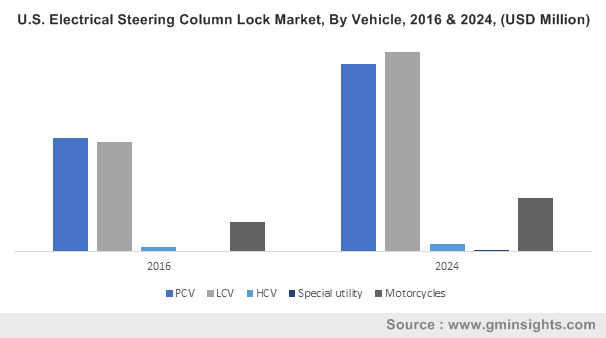 PCVs are anticipated to capture nearly 40% volume share in electrical steering column lock market over the forecast timeframe owing to substantial production of these vehicles across the globe. Rising deployment of electric power steering (EPS) in these vehicles will further support the segment dominance till 2024. China’s share in SUVs increased to 48% in 2016 from 27% in 2012. One out of every two cars sold till 2022 is expected to be an SUV. High deployment from local and international brands will further escalate the revenue generation. Special utility vehicles will depict a CAGR of over 4.5% in the next eight years. Significant growth of the segment is credited to the accelerating production of all-terrain vehicles around the world. OEMs are expected to capture maximum revenue share over the forecast timeframe owing to their process expertise coupled with customer’s trust towards the manufacturer. High performance vehicles and continuous efforts of industry players for development of cost-effective solutions are the factors responsible for the strong preference towards OEMs. Substantial automobile production will further accelerate OEM demand for electrical steering column lock market size till 2024. Aftermarket will showcase a significant growth over the coming years. It can be attributed to the rising demand of aftermarket spare parts of vehicles from local and international market due to price competitiveness in these vehicles. Rising vehicle ageing in developed countries will further push the production rate of these automobile spare parts, thereby supporting the industry growth till 2024. Asia Pacific is anticipated to dominate the electrical steering column lock market crossing USD 13 billion till 2024. The high revenue generation can be attributed to high automobile production, especially passenger cars across the region. China was counted among the largest automobile market in 2016. In India, the utility vehicles showcased a growth of almost 30% in the same year. Rising penetration of electric vehicles will further support the region’s dominance over the next eight years. North America is poised to grow at over 6.0% from 2017 to 2024. 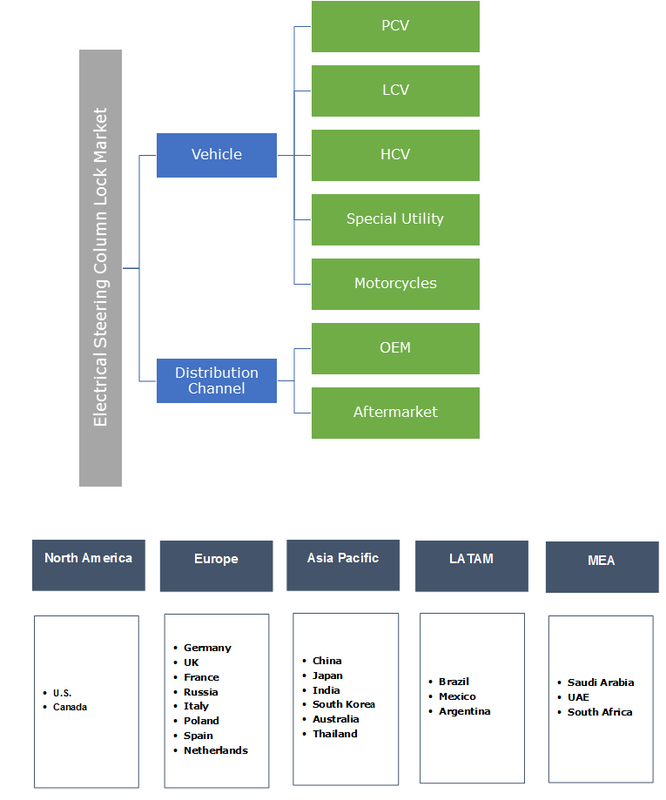 Rising vehicle ageing along has led to the growth in aftermarket in developed countries such as U.S. Stringent regulations regarding EPS adoption will further enhance the regional growth over the coming years. Nexteer Automotive, Robert Bosch, ZF Friedrichshafen AG, NSK Ltd., and Nissan are among the prominent participants in electrical steering column lock market. The industry players focus on catering the customer demands owing to rising security concerns. For instance, in March 2017, Nissan took an initiative to replace the conventional steering lock with an electrical steering column lock for cost free in Nissan Altima and Maxima models. This strategy helped the company to gain traction among the customers. Manufacturers are also indulged in new vehicle parts development for gaining competitive edge. For instance, in 2013, NSK Ltd. introduced an innovative column lock mechanism that improves the overall system design and performance. Electrical steering column lock is designed for ensuring the security in vehicles. Conventional steering wheels possess mechanical column locks. It blocked the steering in a slightly off position and deployed multi-plate technique that involved layering of numerous plates for creating friction that locks the steering wheel. Rising penetration of EPS has resulted in high production rate of these column locks. Various automobile OEMs have implemented these column locks in their vehicles. For instance, in July 2015, Continental Automotive Components India produced a Passive Keyless Entry (PKE) system that provided electrical steering column lock control through its control unit. This PKE system was adopted by Mahindra & Mahindra in its face lifted version of XUV500.